157: The sun was shining on The Boy's windmill and I loved the vibrancy of the colours; speaks of Summer to me. 158: Sunny and beautiful skies! 159: The Boy came out of school waving this photocopy of work he'd done with his teacher today. I can't say I understand why the + symbol is on the right, or why the carried numbers have been written where they have, but my (then) 6yr old used column addition to add thousands! Wowsers! 160: I'm cross! Not only have I had to have parts of the heating system replaced once on my car as a precautionary matter (bloody Vauxhall Zafiras bursting into flames with no warning! ), but now they've sent out a letter again telling me that the fan bit needs replacing now. The advice is to either use the aircon/heating system on 0 or 4, and if it starts to smoke on 4 then turn it to 0. Great hey? Worse is that the replacement parts are being manufactured atm and won't be ready until August. Wonder how many Zafiras will have to be recalled for this? 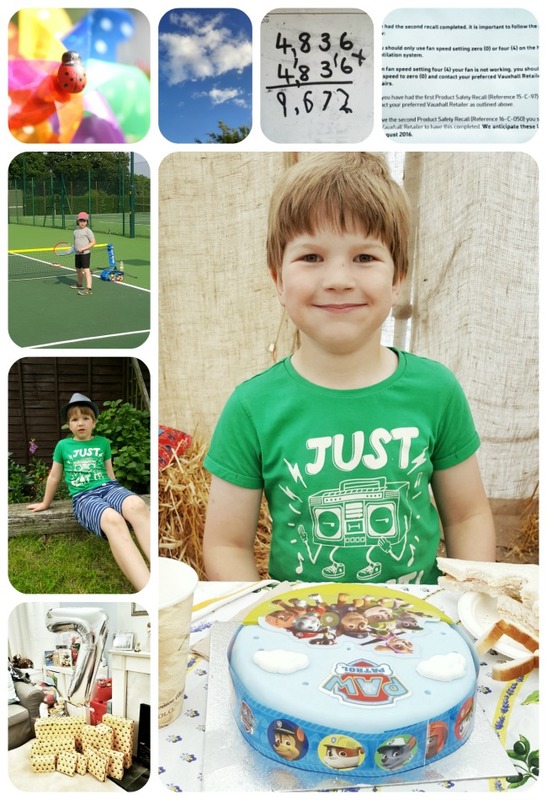 161: He started his tennis lessons today, the first of six LTA Free Tennis for Kids sessions, and he had an absolutely amazing time. 162: Interview With A 7 Year Old time! But I haven't had time to post it yet but here's the YouTube link. 163: Birthday party time! The strawberry picking party at Hendrewennol was amazing and everyone had a really good time. I think this might be his last big party though for a while, just a few friends at home next year will do. And an extra photo of his presents all wrapped up and ready for an excited seven year old in the morning! 164: A very blurry photo of The Boy ripping the paper off his presents, he was so happy with everything we gave to him. But the main one of the day is of The Boy and his birthday cake. Presentation is not my strongest point with cakes, but he's always ever so chuffed with my creations, and this year was a battenberg style Minecraft chocolate cake. The actual cake was blocks of green chocolate chip sponge, and chocolate fudge sponge. It was meant to look like the blocks of Earth once you start digging down in Minecraft. He loved it! 165: Playing with the characters from his Playmobil birthday present, he was having great fun! 166: Cuddles with his cousin, he adores her. 167: Playing one of his birthday presents with daddy. 168: Bathtime fun with The Boy. I'd taken Mr. TBaM to the dental hospital to have a wisdom tooth extracted and he was recovering downstairs. He's only ever had one filling before so was genuinely shocked at how barbaric an extraction is, poor thing! 169: After school playtime up the clifftop park, ten minutes later it was absolutely hammering it down. 170: We've had a cracking day doing lovely normal things; sounds silly but it really has been. I took The Boy to a tennis session at 10 o'clock, then he stayed and played with a classmate after, we walked up town and had a lovely chat over a pasty lunch, then did a little shopping and came home to wake daddy up from a long nap. There was an owl rescue organisation in the town centre, and The Boy was fascinated with them. i will watch the video later when i have some peace and quiet! Happy birthday to The Boy! It looks like he had a fantastic time and well done on the cake! I bet you're very proud of The Boy for his maths! How Mr TBaM is recovering now – it's not a lot of fun having a wisdom tooth out, is it? All birthday present opening photos should be blurred shouldn't they! Looks like he had a wonderful birthday and that take is fab.